After a somewhat spluttering start to the year, I finally managed to record a respectable weekly mileage total. I ran, jogged and limped 69.7 miles around the streets and trails of Leeds this week. That didn’t include a proper long run so I am very happy with the mileage for the week. My achilles is still grumbling on, self-treatment this week was to basically ignore it and get on with running, perhaps at my age I just have to accept that I will have to run with a bit of discomfort. For the first time in over a month, I stood on the start line of a road event – Woodhouse Moor parkrun – with the intention of ‘going for it’. For a generally shy and not terribly confident guy, I’m more confident when it comes to sport. Competing at sport is where I feel I can most easily be true to myself. I’m a classic jack of all trades at sport – I have a reasonable aptitude for most sports without being especially talented at any particular sport. During my life have regularly played football, cricket, golf, table tennis and squash to an OK standard. As a boy and young adult, cricket was always my first love. I think a lot of that was because I was probably amongst the best cricketers at my school. I was captain of the school cricket team at middle school (age 9-13), albeit a down-at-heel backstreet inner city school in Leeds. I think it may have given my Dad and me ideas that I was better than I actually was. When I was 12, my Mum and Dad sent me on a winter coaching and assessment weekend at the indoor school at Lord’s cricket ground. It must have cost them a fortune. I had never even spent a night on my own away from home and I was driven down to London by my Dad on Friday morning and then left alone in a posh 4 star hotel about a mile from Lord’s. For a painfully shy 12 year old, it was overwhelmingly terrifying. If that happened now, I’ve no doubt that the social lynch mob on Facebook would call it ‘child abuse’ or some other ridiculous over the top phrase. I thought it was the most exciting yet frightening thing that had ever happened to me. It’s funny what you remember from such formative experiences. I was so nervous that I struggled to find the restaurant in the hotel on that first night because I was too scared to ask anybody where it was. When I eventually stumbled across it, I realised that with my meal voucher I could only afford one thing on the menu – burger and chips. I wolfed down the food and retreated to my hotel room to check my cricket kit and I even remember watching ‘Mork and Mindy’ on TV for the first time. I thought it was hilarious. The following morning, I was collected by a chaperone, a young member of the MCC groundstaff, to take me to Lord’s. It was Phil Bainbridge, who went on to have a long and fruitful career as a middle order batsman with Gloucestershire and Durham and was unlucky not to play for England. Because of a midwinter snowstorm, I had missed my originally allotted week and I found myself pitched in with boys older than me, mostly the Hampshire under 15 squad, as well some other young up and coming Southern cricketers – public school types. I was overwhelmed and completely out of my depth. Back in Leeds, I played cricket with my peers as if I was king of the hill, opening the batting and bowling and bossing them around in the field. At Lord’s I was just a scared little boy. In my first net, I was batting against the Hampshire colts, all two or three years older than me, bigger and stronger and too quick for me. I was used to batting on slow pudding-like pitches in Yorkshire against bowlers that I could smack around with ease. For the first time in my life I was batting in an indoor net, on a hard slick bouncy surface (with no helmets in those days). Shaking with nerves, I barely lay bat on ball for the first couple of dozen balls fired down at me. I’ll always remember looking at the boy in the net next to me. He was small – a couple of years younger than me – but swarthy-skinned, cool and good looking and phenomenally confident. As I poked around and missed most of the balls I faced, all I heard was the loud crack of his bat and saw the net bulge beside me as he smacked the ball around. He owned the place. I knew then that I was never going to be a professional cricketer. I made of point of sneaking a look at the list to see who the other boy was. He had a very unusual name – M. Ramprakash. My point is that sporting confidence is all relative and for most sporting events I pretty much know what my performance will be. At most races I think that I can predict to within a few seconds what my finishing time will be. I’m usually pretty much bang on. In my view, training tells you how fit you are. Races are all about executing and delivering your maximum effort over the distance. However, this week at parkrun, I genuinely didn’t know if I would be able to run 18 minutes or 19:30, I had no real measure of my current fitness. I ran really hard, on the rivet, but blowing virtually all the way and yet I felt slow and cumbersome lacking any ‘zip’. I still managed to run a time of 18:17 and it was probably worth a few seconds quicker as I got held up at the start and on the muddy bank on each lap where there was zero grip, so I can conclude that I am probably a bit fitter than I thought I was – a pleasant surprise. Today, Sunday, was the fourth race in the Peco cross country league. It was held on a narrow, muddy and twisty course at Golden Acre Park, just a couple of miles from my house. I decided to wear my Inov-8 trail shoes rather than spikes, so that I could run to the event and dispense with a rucksack. I think the volume of miles and the hard parkrun caught up with me today because I had a bit of a shocker. I haven’t seen the results yet, but I know I finished well down on my previous finishing positions as many of the lads that I would normally beat finished well in front of me, it was one of those races that I never got into. At the club last Tuesday evening, we had a bit of a marathon evening – a chance to meet after the weekly speed session and chat about marathon training plans. Our best ever runner, Tracey Morris, came along to give us the benefit of her experience. Tracey ran for GB in the 2004 Olympic marathon, famously qualifying out of the blue at the London marathon. She went on to finish fourth in the Commonwealth Games two years later. She was generous with her time and gave lots of very sensible advice. Surprisingly, she was never a high mileage runner – usually only around 60-70 miles per week. However, she ran her long runs hard – often running 20 miles on a Sunday at only 30 seconds per mile slower than marathon race pace. Perhaps her advice that resonated most with me is that because she ran so hard, she had to recover properly – indeed she felt Tuesday evening was too soon to run a speed interval session after a Sunday long run, so she moved her speed work to Wednesdays. 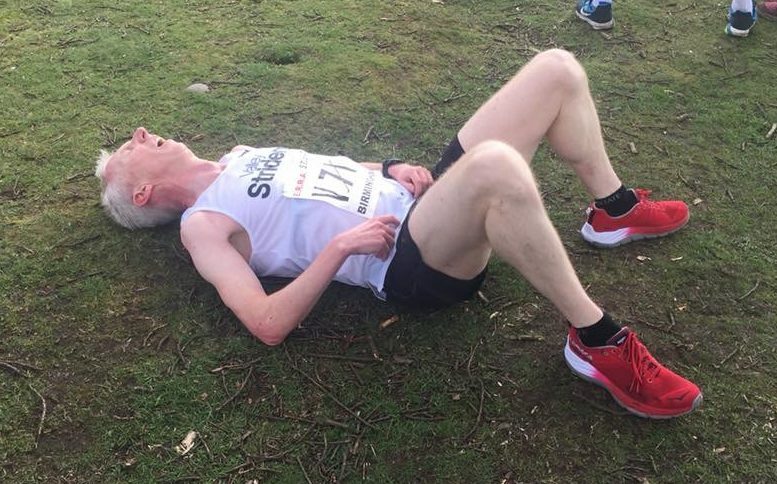 Basically you have to rest after hard runs, especially as you get older. No wonder I was crap at the Peco today. I’ll be having a much easier week next – still at least the Comrades rocket has cleared the tower!